Full Tilt has unleashed a new TV marketing campaign for UK and EU audiences, and dropped Gus Hansen and Viktor Blom as representatives. The move confirmed earlier suspicions that circulated after images of the two players were removed from the company’s website and poker client. According to statements from Full Tilt, the decision to drop the team of sponsored pros known as “The Professionals” was a calculated one that represents a change in the company’s overall marketing strategy. 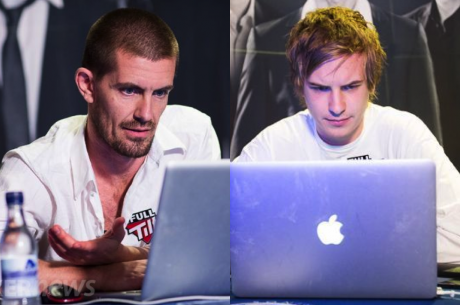 When Full Tilt originally relaunched in November 2012, the site debuted a team of three high-profile players that made up their professional team: Hansen, Blom and Tom “durrrr” Dwan. The site’s relationship with Dwan ended last December. According to the spokesman, the move comes not because of any particular problems with the sponsored pros, but rather because of a shift in the advertising and promotional strategy at the site. “This follows a year-long review of the Full Tilt brand and a decision to move away from pro-centric advertising to focus on the experiences and stories of the vast majority of our players,” the spokesperson said. That most populist approach to promoting the poker room will apparently extend beyond just cutting down on pro sponsorships. Sure enough, just days after announcing the drop of Hansen and Blom, Full Tilt unveiled a new television advertising campaign that reflects the new strategy of focusing less on aspirational poker superstars, and more on “average Joe” smaller stakes players. The move is just the latest example of a large-scale pullback from sponsored pros by many major poker sites. The Amaya Gaming-operated poker rooms have been particularly stingy with their sponsorships as of late, with PokerStars also pulling away from their sponsorships in recent months. First, PokerStars dropped three of its most prominent professional ambassadors in Latin America, including long-time partner Humberto Brenes. That was followed by a recent announcement that the company wouldn’t be renewing the sponsorship deals it had in place with Joe Cada, Marcel Luske and Alex Kravchenko. Other companies have also scaled down their professional teams. Earlier in October, partypoker ended its relationship with Marvin Rettenmaier. Ultimate Poker has also cut ties with many players, including Phil Collins, Jeremy Ausmus and Jason Somerville. The new direction for Full Tilt may attempt to shine a spotlight on the site’s wide range of games, which now includes a full suite of casino games alongside their poker room. “Full Tilt will celebrate the excitement, fun, and intrinsic enjoyment of playing our poker, blackjack, roulette and slots games,” the spokesperson said. With the removal of “The Professionals,” the only known sponsored pros that are associated with Full Tilt are the Black Card Pros, a group of players who won sponsorships based on their play on the site. Blom and Hansen have both been very popular figures on Full Tilt, where they are frequently seen at the highest-stakes cash game tables attracting action. However, both have reportedly been losing money in these games as of late. A recent heads-up event between the two players that was part of a promotional push by the site saw Hansen fail to show up, forcing Jake Cody to step in to play against Blom at the last minute.